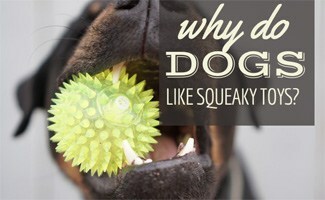 Home > Play > Dog Toys > Why Do Dogs Like Squeaky Toys? You may think your dog is just trying to annoy you with its constant chewing on the squeak toy, but that’s not it. There are reasons that your dog loves that “squeak, squeak” sound and it has to do with its instincts. Dog’s love the noise that comes from biting the squeaky toy. The sound that comes from their action tells them they have an effective bite that is enough to create a reaction. The squeak tells your dog to continue biting, whereas a toy without a squeaker gives no feedback at all. 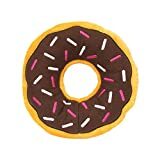 This donut dog toy contains no stuffing and 2 squeakers. It is available in various sizes to fit your breed best. Dogs descended from wolves, and we all know wolves hunt for their food. It’s this predator and prey relationship that attracts dogs to squeak toys. The squeak in the toy sounds like an animal that is injured or scared. This sound sparks your dog’s inner drive to attack. Once the toy stops squeaking (aka, your dog has broken the squeaker), it tells your dog that it has successfully “killed” its prey and it no longer needs to attack. This hunting instinct is common in terriers, sporting and herding breeds. 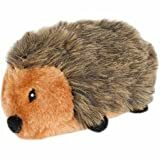 The hedgehog toy has 6 squeakers in it for your dog to chew and bite. The circular shape makes it fun to put your dog’s nose through and figure out how to escape too. Another option is this hide a squirrel. 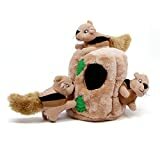 If your dog loves squirrels, this is the toy for them. The squirrels squeak, and you can hide them in the tree trunk for your dog to find. 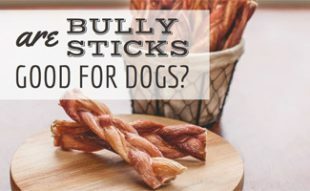 Allowing your dog to act on its instincts is healthy for them and lets them be a dog. Letting them “hunt” their squeaky toys lets them relieve pent-up energy and explore that wild side in them. If your dog has adequate play time, it reduces the chances of unwanted behavior towards items that aren’t toys like your couch or flowerbed. The squeak can get your dog’s attention, so you can use it as a reward. 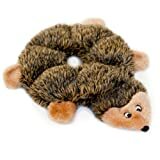 Offer your dog the squeak toy if it is doing something undesirable. For example, if your dog has your shoe in its mouth, offer the toy instead as an alternative. Check out this video to learn more about why dogs like the squeaky noise. 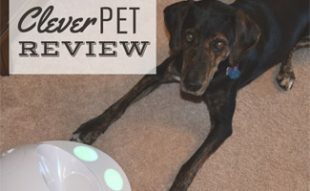 It’s important to always monitor your pet when they are playing with toys or eating treats, so you know when something goes awry. Read Maverick’s story and how pet insurance saved Kristin from a financial disaster. After X-rays, the emergency vet determined that there was an obstruction; by this time the night had progressed to 1am and Kristin had to leave Maverick overnight. “Nothing prepares you to leave your new baby at the vet’s office and have to sign a paper giving them the rights to do major surgery (or whatever it takes) to save your dog in your absence,” she says. The very next day, they performed foreign body obstruction (FBO) surgery on Maverick and removed a squeaker from the rope toy (“We didn’t even know it was in there!” exclaims Kristin) that he’d swallowed. He stayed in the hospital for four full nights, and the bill was hefty: $6,220 for foreign body removal surgery and follow-up care. Maverick has since recovered and is doing fabulous today: “You cannot see his scar anymore on his belly and he is back to being a crazy 10-month old pup!” And Kristin is thankful she had signed up for pet insurance and was reimbursed $4,798 in vet bills. If you love your dog like family but wouldn’t be prepared to pay thousands of dollars for an unexpected accident or illness, consider pet insurance. By enrolling as soon as possible, your furry family member is covered, and so is your wallet. Start by getting a free quote. You should never let your dog play with a toy unsupervised. Toys wear down after enough play, and dogs should not ingest most parts. Always check your dog’s toys for holes and replace them if stuffing or squeakers are coming out. 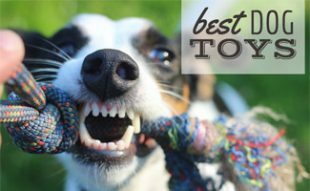 If you want to treat your dog to some new toys (with or without squeakers), check out our list of the best dog toys. 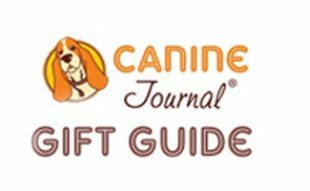 It includes squeaky toys, toys to play catch with, chew toys and more. How does your dog play with its favorite squeak toy?